Yank Barry, Muhammad Ali, Gary US Bonds and the rest of our Global Village Champions have worked to provide nearly one billion meals to hungry people around the World. Yank’s determined efforts to provide meals to the hungry were recognized recently when Mr. Barry was nominated for the 2012, 2013 & 2014 Nobel Peace Prize. Our primary focus is A Day Without Hunger. This is a challenging task given the extraordinary political and economic conditions in many parts of the Globe. It is only made possible as a result of our strong and proven leadership and the dedication of the Global Village Champions member volunteers. Chairman Yank Barry have undertaken humanitarian relief missions over the past 17 years. 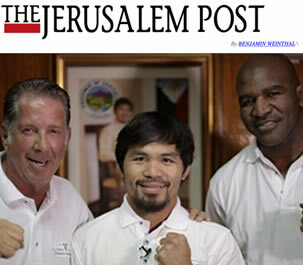 As press began to follow so did the helping hand of other major celebrities who joined in the effort of “Doing Well By Doing Good.” These efforts have gone on the help such programs as the Red Cross, C.A.R.E, the UN and other organizations world wide in need of meals, medical supplies, books and toys. 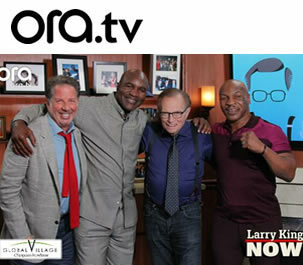 Evander Holyfield, Mike Tyson and Yank Barry join “Larry King Now” today to chat their storied boxing rivalry and their philanthropy.